Find yourself in your own home feeling like you can’t get away from it all? Rather than taking on some extreme – and extremely uncomfortable and non-ergonomic – re-imagining of the broom closet, perhaps you could go the way of the very 1960s looking Cocoon 1 mobile room. The Cocoon 1 is from the Zurich company Micasa Labs, and is designed by Per Ericsson. 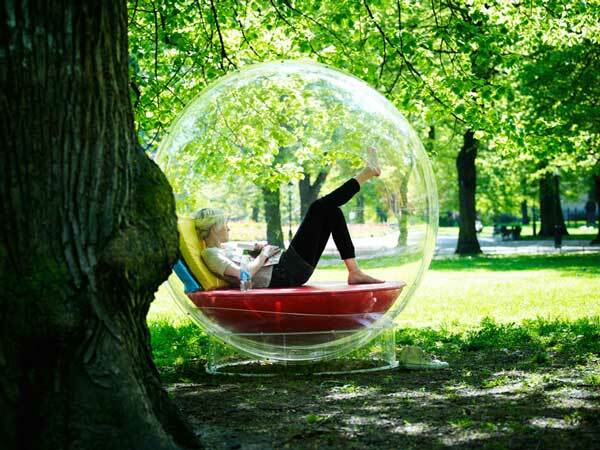 It’s a 1.8 metre diameter plastic bubble, with a range of modular options to turn it into the personal space that you need. There’s a basic set of structural components inside, to which you can add two ‘pillow / backrest’ options for relaxation, or a home office with complete with router and power. More options? How about adding the kitchen module with a running water and a stover for ‘basic cooking’. If you want to place it outside the Cocoon 1 can be placed on the ground, or suspended from a tree. Sounds great, looks cool, but I would be wanting to to add the ‘Stop All Insects and Critters’ module to REALLY keep the place to myself. And the place options don’t stop with placing the Cocoon 1 in a room, a garden, or a tree. With the addition of the Foundation Pb lead weight, the mobile room can be placed on water, allowing you to have your very own floating home office Zorb. “Having enough room – or space – is a very current subject. It is also a great challenge in our branch. The solution is to use existing resources cleverly. Cocoon 1 is a research project which examines how much space is really needed. It should help us in the future to develop products which tackle this problem with much cleverer ways and means than current concepts”, says Matthias Wunderlin, manager of Micasa. A research project it may be, but the Coccon 1 will go on sale later this year, in the Northern Hemisphere autumn, from around the US$3,000 price mark. Click any of the thumbnails below to see larger versions of the images. Im looking to get hold of, or hire this bubble for an internal launch for a company at the begining of July. Do you have any contact details about the Cocoon 1. Any help would be appreciated.